We do not accept any Hotel Voucher/Room Booking Receipt issued by any other Website/Booking Agent. Welcome to Cottage Yes Please ..
Cottage Yes Please is one of the best New Delhi Budget hotel providing 45 air conditioned and air cooled luxuriously appointed rooms and suites with attached bath, Wifi Enabled - Wifi Access in the rooms, hot and cold water, Colour TV with Multi channel cable, 24 hours power backup, mini refrigerator, 24 hours Room Service, Internet Services, etc. The roof top of hotel is well decorated which provides a panoramic view of New Delhi with prominent buildings dominating the skyscape. Whether it is the thrill of a vacation or the responsibilities at work that bring you to Delhi, you are sure to find Cottage Yes Please, the perfect budget accommodation in Delhi for you. 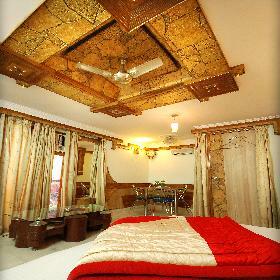 This budget in Delhi offers fine facilities, excellent service and a luxurious ambience. Cottage Yes Please has a Multi Cuisine Restaurant, Travel Desk which offers Currency Exchange, Air Tickets, Railway Tickets, Taxi Service, Airport and Railway station Pickup & Drop facilities, Holiday packages, Tour and Travel packages. 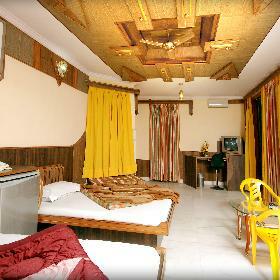 Cottage Yes Please, a Budget class hotel, is Centrally located at Main Bazar Road, Paharganj, New Delhi. It is within a short drive to all areas of Delhi offering budget accommodation in Delhi, 500 metres from New Delhi Railway Station, 3 Kms. from Old Railway Station, 12 Kms. 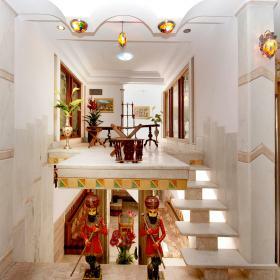 from Indira Gandhi International Airport, 1 Km from Connaught Place and just few minutes away from Government Offices, Historical Sites, Cultural Centres, Religious Places, Shopping Malls and Trade Fair ground.